Welkom op onze Manuel Antonio huis, een volledig bemande, 6 slaapkamers, 6 badkamers luxe Villa and Guest House in een ongewoon particuliere en prachtige omgeving grenzend aan de 50-meter Maritime beschermingsgebied. De Villa en Guest House zijn neergestreken hoog boven de Stille Oceaan, met de altijd aanwezige zeebries en de geluiden van de branding hieronder crashen. Ons strand (Playa la Macha), die meestal wordt verlaten, ligt op 15 minuten wandelen van de villa. Ours is de enige woning in Manuel Antonio met een inham allemaal zelf en een van de weinige dicht genoeg bij het water naar de branding crashen tegen de rotsen te horen. Het uitzicht op de oceaan en zonsondergang vanaf de Villa zijn adembenemend. Wildlife en tropische bloemen in overvloed op ons terrein en in de omliggende regenwoud. Apen, talloze vogels, en af ​​en toe een luiaard zijn regelmatige bezoekers naar het nabijgelegen bomen en zijn makkelijk te herkennen van de villa en de terrassen en het zwembad. Het huis is van de beste constructie in teak, ceder, amandel, en terra cotta, alle gelegen in een prachtige aangelegde terrein. Elke slaapkamer heeft een uitzicht, een kingsize bed en een eigen badkamer. Twee van de slaapkamers hebben een eigen leefruimte, in aanvulling op de lichte en luchtige belangrijkste leefruimte. 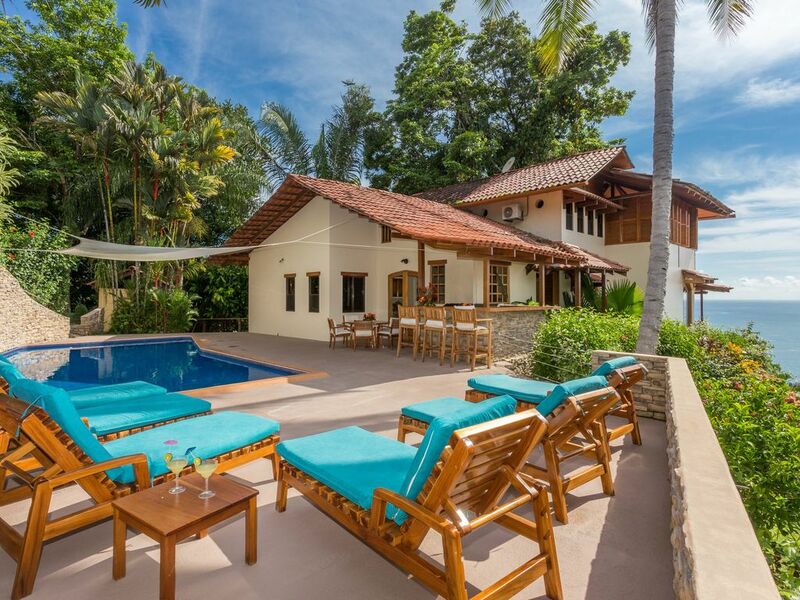 Villa La Macha is gelegen in een van de mooiste kustgebieden van Costa Rica, Quepos en Manuel Antonio. Een bijna eindeloze reeks van afgelegen baaien en tropische stranden en de charmante, goed geleverd stad Quepos zijn minuten. Vijf mijl op de weg is een juweel van dit ecologisch kwetsbare land, Manuel Antonio Nationaal Park. De wateren voor de kust bieden een aantal van de beste marlijn en zeilvis sport vissen in de wereld. Villa La Macha is fraai ingericht in teak meubelen en originele kunstwerken en biedt een prachtig huis voor gezinnen, kleine bruiloften en groepen vrienden te delen. Buitengewone uitzicht op de oceaan en de jungle, zo dichtbij je kunt de golven hieronder horen. Volledig bemand - we wassen, koken en alles schoonmaken. We zullen ook alle reizen voor u regelen. Our group of 10 adults, consisting of family and close friends, had an amazing time. Plenty of room in the main living area, including the deck and pool, for everyone to hang out together. But we all really appreciated the privacy of each beautifully appointed guest suite when we wanted to get away from the crew. By far what made this such a great experience was the wonderful family that took care of us while we were here! Walking into the villa late afternoon on the first day to a beautiful sunset and a table full of fresh fruit and the best guacamole ever made us quickly forget the flight delays and 3 hour trip from San Jose. Each day they set up excursions from horseback riding to a waterfall to a sunset catamaran cruise. The meals the ladies fixed were delicious and we all went home several pounds heavier!! We hated to leave but look forward to coming back again! We had 11 people at the house for a week. We had the best vacation ever. The home is absolutely amazing. When we paid to go out on a sunset cruise the second night, the catamaran stopped IN FRONT OF OUR HOUSE to watch the sunset! It was that amazing! Evelyn and Carmen are such wonderful caretakers. They fed us tons of healthy, fresh foods. Jota was there ANY time we needed him. He was such a helpful guide, leading us to the right tours, the best beaches, and top-notch restaurants. Besides wishing at times we had of left a few kids at home, we would not change a thing and will definitely be back to the house in Costa Rica! Awesome one week stay with friends! I stayed here with 10 friends for a week and had an amazing experience. Jota and his family are super friendly and helpful which made for a very smooth and relaxing experience. The fresh fruit and meals they prepared based around our schedule were perfect. The views of the pacific from the house were stunning and the location offers easy access to the many activities in the area. The howler monkeys, birds and lizards in the secluded area add to the whole experience! I can honestly say this was one of the best vacations in a long time. The property is just as shown on the website if not better, both the villa and the surrounding area and views are beautiful. Monkeys, iguanas, toucans, macaws, and all types of other birds to be seen. What truly made the vacation exceptional were the house hosts, Jota, Evelyn and Carmen. They were there to greet us upon our arrival (after a very long day of travel) to show us around, answer any questions, Jota headed to the grocery store to pick some things up we needed, Evelyn and Carmen prepared dinner for us and after dinner to my surprise, Jota had picked up a Tres Leche birthday cake with candles for me. This was just the very first day and we didn’t arrive until late afternoon. I really can’t say enough about Jota, Evelyn and Carmen, every day they cooked delicious meals beyond our expectations, they did our laundry, they cleaned up after us, they went to the grocery store, they arranged for any excursions we wanted to go on, transportation to and from the airport, they visited with us, pointed out the wildlife and different plants/trees and when the monkeys didn’t show up Carmen and Evelyn literally called for them to come and they came. They are amazing, hard working people that always had a smile on their faces. There were 12 people in our party and the layout of the house was perfect, plenty of space to hang out together or spread out for some alone time. Pool area was great, we used it all the time. The trek to the beach below is a good 10-15 minute walk and a little steep, not bad going down but a little tougher going up but so worth it. Trip to villa from airport is about 2.5 hours but nice drive and property is secluded but easy taxi ride to and from town. We have already referred friends to consider this property, they won’t be disappointed. It was an honor to have all of you with us! Jota, Evelyn and Carmen are more than happy having you with them. We hope you can join us again one day, wishing you the best. Pura Vida! After February 14 - 20 2019, Villa La Macha will never be the same! What an amazing trip we had! Our group was made up of 6 couples (in 30's-40's)! This house was perfect for us. All the rooms were spread out so everyone had their own space. The views this house offers from all areas are gorgeous! The pool was big and had nice furniture to relax on and bar area. The sunsets are to die for! This house is very private and secluded which we loved! I want to rave about the staff for a minute..
Jota - You are awesome! You were at our every need! You planned our excursions ( zip lining and 4 wheeling) Arranged the BEST couple massages ever (on the master porch with waves crashing and nice breeze! ), Grocery shopped for us, ran to liquor store for us when we were in a pinch, and planned our meals for the day! If we needed him he was a phone call or text away for anything we possibly needed! We could have sat around the table for hours just chatting with you! Evelyn and Carmen - Just dolls! These ladies cooked the most amazing meals everyday for us as we wanted! This is good home cooked food!!! I would love to have some of your grilled Mahi right now! Every morning you prepared the most beautiful breakfast table to start our day out. The house was thoroughly cleaned daily, even linens! You girls are awesome! So kind and quiet, we didn't even know yall were around each day! You met our picky eaters needs also! They also did our laundry each day! Paula- Although we never met, you communicated great with me while planning this big trip for a lot of people! Let Paula handle your transfers to and from airport and any other transportation needs! So sweet! She is awesome and the vendors she uses are too! I will be bringing my kids and family back to this house in the coming year. I can't wait to spend another week at Villa La Macha! Will hopefully be booking soon! A little TLC could be given to a few things but they didn't damper our trip.. a few light bulbs were out throughout, ac in 2nd house master wasn't working efficiently, we had some problems with the safes, I am sure you will fix soon! DO NOT TRY TO WALK TO QUEPOS - GET A TAXI - unless you are super fit! If you have leg problems do not try to hike down to beach - although it is amazing when you get there! GO TO PLAYA LINDA , do a fishing charter on Tranquilo, eat at Lobster Town, let Jota buy everything and arrange everything for you! See ya soon Villa La Macha! What an amazing review, we are so grateful and we hope you can enjoy this house again one time, we will be waiting for you! The staff sends a big hug for all of you! We will resolve those things so everything will be better. Thank you so much for everything. Villa la Macha was an absolutely amazing place to stay. If you are considering a place in the Manuel Antonio/Quepos area then make this it. I promise you wont regret it! The staff was great to work with. Hota arranged any activities and picked up all of our food. He answered so many questions about the area and gave great recommendations on things to do. Evelyn and Carmen cooked the best meals for breakfast and dinner. They also did our laundry and dishes. Everyone in our group was sad to say goodbye when we left. The house itself was simply amazing, and the view was the best I had ever seen. There were 16 people in our group and we never felt crowded. The house is literally in the middle of the jungle so be prepared for monkeys, iguanas and beautiful birds. It adds to the experience. The beaches near Manuel Antonio are beautiful, but our favorite was Playa La Macha located just below the house. It is a steep 15 minute hike but worth the effort. It was never crowded and we had plent of sand to play games and let the kids run. At low tide, the kids loved playing in the tide pools. Overall this was my favorite vacation that I have ever been on and I attribute that to the house and its amazing staff. We are are already talking about coming back. Thanks again to Hota, Evelyn &Carmen!